I was invited to try this newly opened restaurant located along "The Shoppes" at Marina Bay Sands. The restaurant concept is modern Indonesian food, which so far hasn't really been done in Singapore. The Indonesian born Chef has been trained in French cooking and has been working in renowned restaurants in Australia, including Tetsuya. 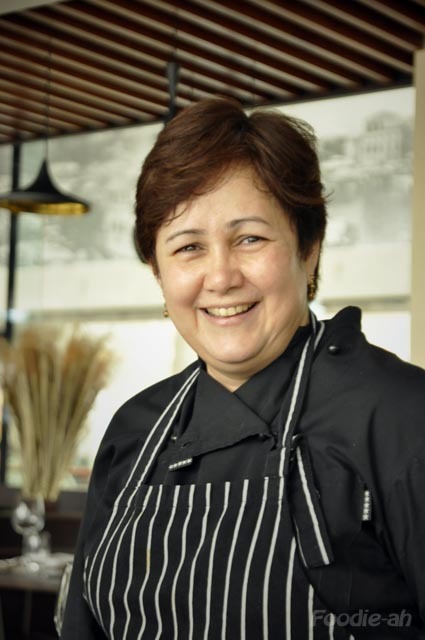 Her vision is to redefine Indonesian cuisine maintaining the traditional flavours, but selecting the best ingredients and utilising French and modern cooking techniques to bring Indonesian cuisine to a whole new level. 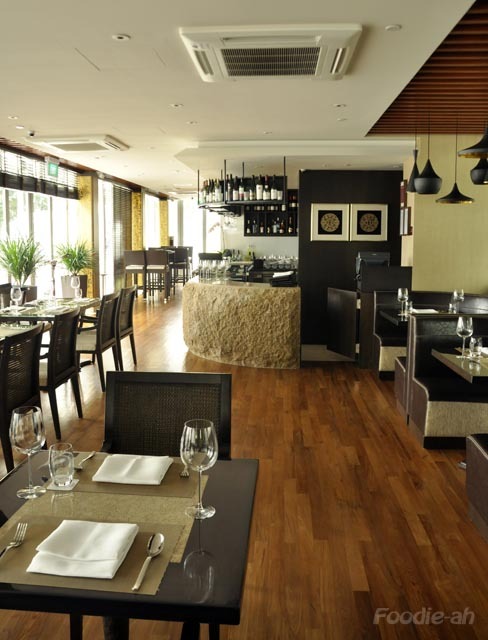 The restaurant enjoys a spacious, elegant and contemporary dining room, with plenty of natural light filtering through the venetian blinds around its perimeter. The view over the bay makes it a perfect place for an evening dinner, but it's also a relaxing sight over lunch. The deco is simple and modern, with materials such as stone and wood, and a few Indonesian motifs to recall the theme of the menu. While waiting for the food, we were served an amuse bouche together with some Indonesian chips and the Chef's signature selection of Sambal. Apart from the garlic sambal I enjoyed the rest, in particular the less mashed one, with roughly chopped chillies, ginger and shallots. For starters we had a selection of sate. Each one was served with its own sauce, although they didn't actually need extra sauce as they were perfectly flavoured. The Sate Padang Lidah Sapi ($27 for five skewers) was the biggest surprise. I have been familiar with beef tongue since I was a child, as it's commonly eaten in Italy. Having it as Sate was a bit of a novelty. It didn't actually feel like eating tongue and I wouldn't have guessed it if I hadn't been told, but the tender and succulent texture of this skewer was one of the highlights of the lunch. The charcoal grilled Angus Beef ($25) and Sakura Chicken ($22) skewers were also outstanding, although the beef tongue is really what I would come back for. 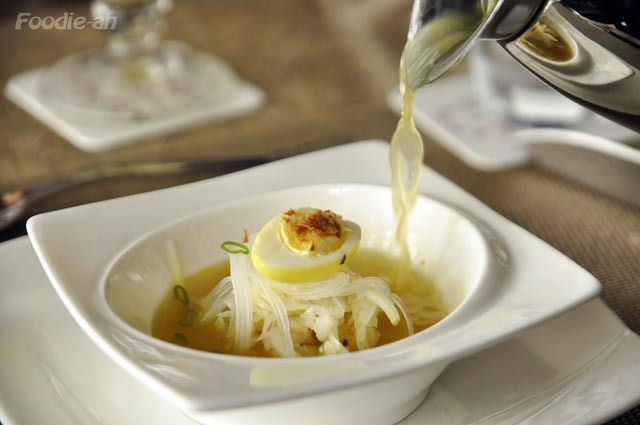 To clean the palate, we were served a Soto Ayam Lamongan ($15), a spiced chicken soup with shredded chicken. The flavours were clean and delicate, and half way through it I enhanced the flavour by adding a touch of squeezed lime which gave it a tad of sharpness. Udang Blado Padang ($35) was a fried king prawn with sambal and cherry tomatoes on top of a grilled aubergine. I found this slightly under salted so the flavours didn't really strike my senses as hoped. I was a lot more excited about the Ayam Sakura Tangkap Aceh Selada Mangga ($19), a green mango salad served with deep fried chicken and herbs. 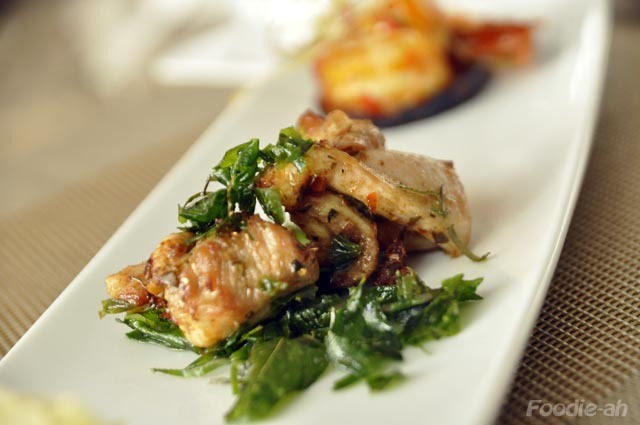 The chicken was crispy on the surface and juicy inside, but the crunchy herbs really added another dimension to it. A well executed classic! Here comes what in my opinion was the best dish of all, the Ikan Bakar Jimbaran ($35). 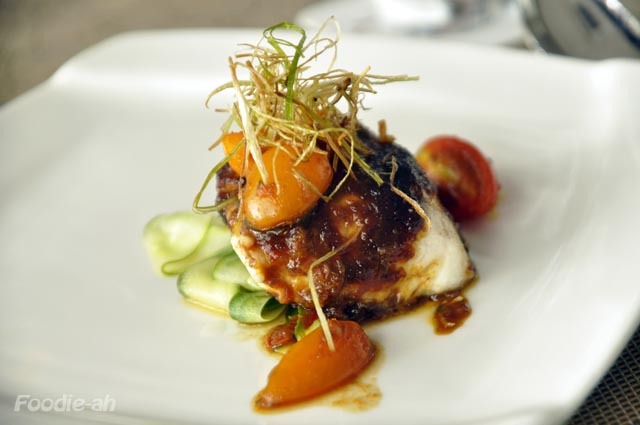 This fillet of sea bass was cooked sous-vide and brushed with a dark, slightly sweet, intensely flavoured sambal sauce. 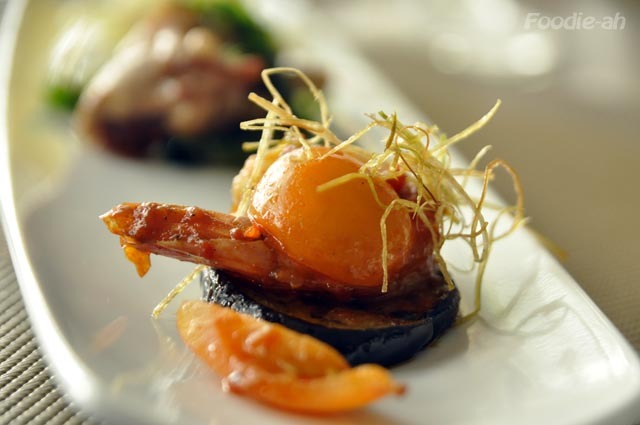 The roasted cherry tomatoes and pickled cucumber slices completed the range of flavours, freshening up the dish. The thick cut of sea bass was tender and succulent, and there was no unwanted "fishiness" to it. I would highly recommend trying this to any fish lovers! Next, another surprise from the Chef: Angus Steak Rendang ($35). 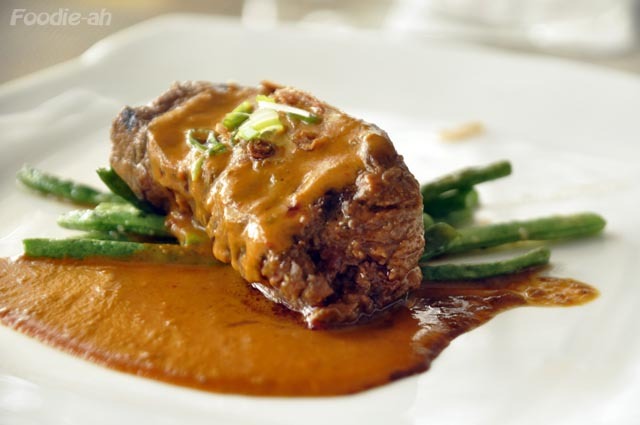 Instead of the classic beef Rendang, this dish combined a French steak with this well known classic. You can actually ask for the steak to be done to your preference, and it will come cooked to perfection, tossed in a rich Rendang sauce. While I personally prefer a braised cut to go with this kind of sauce, all of my dining mates enjoyed this dish the most for innovation and flavour. 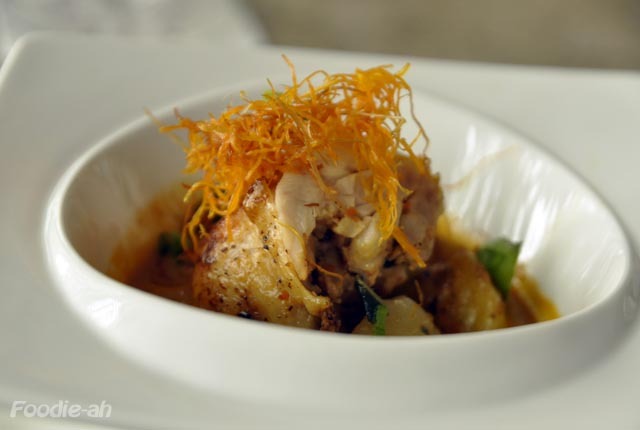 The last savoury dish of the meal was a Confit Sakura Ayam Tuturaga ($33), a confit of succulent chicken cooked in its own fat (all rigorously free range! ), served in a sharp curry sauce. This was certainly a beautifully executed combination of French cooking techniques, which brought out the Indonesian flavours while maintaining the natural juiciness of the meat. This would be another one of my recommendations. 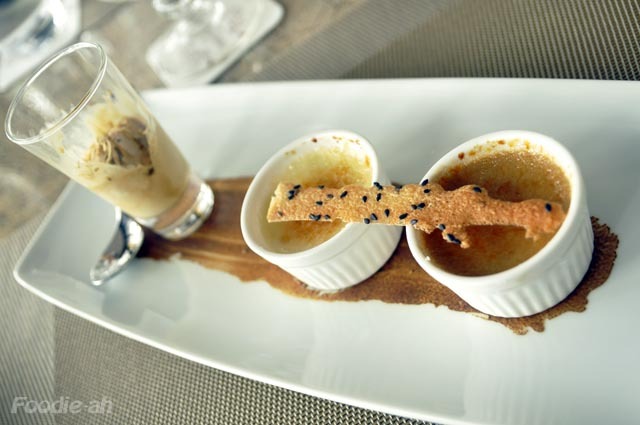 Frankly speaking, I am not a big fan of Indonesian desserts, but the dessert is where the Chef could really make use of her French cooking skills to cater to a more international palate, while bringing Indonesian flavours into the equation. The dessert platter came with two creme brulee and one ice cream. I started off with the Gula Melaka ice cream. Perhaps because I like this kind of sugar and I am happy to eat it on its own, this flavour was absolute perfection for me. The wonderful rounded sugary flavour, with mild tones of caramel and licorice, was true heaven. For obvious reasons, I equally enjoyed the Gula Melaka Creme Brulee, which was less intense and less sweet than the ice cream, with the bonus of a light, crispy shell on top of it. I wasn't too keen on the Sri Kaya Creme Brulee ($17), coconut based with pandanus flavour, since it had that "Indonesian dessert flavour" that I usually tend to avoid, but you would surely like it if you are accustomed to that taste. Chef Alicia Tivey introduced herself and explained some of the techniques and thinking that went into her dishes. It's always wonderful to hear from inspired Chefs who have such dedication and believe in creating an experience for the customer. The Moluccas Room might come across as slightly expensive for an Indonesian restaurant if you simply compare it to other restaurants of the same cuisine, but that wouldn't be a fair comparison. Besides considerations on the location and service, you must acknowledge that the ingredients used are of the finest quality, all selected by the Chef, just as you would find in a fine dining French restaurant. Therefore, this cuisine is positioned at that level both in terms of food quality and price. 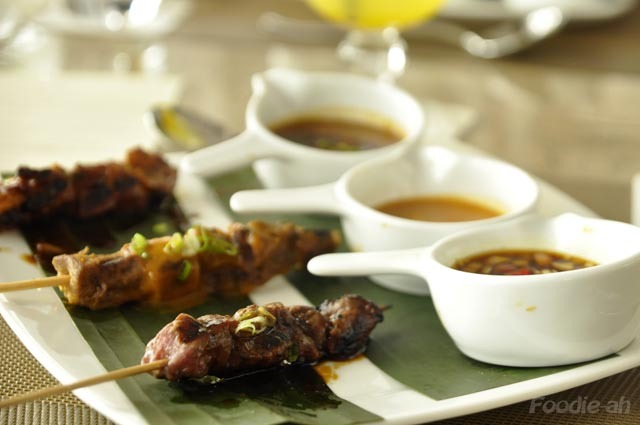 If you are looking for regular Indonesian food, then this might not be the place to go, but if you are looking for a South-East Asian fine dining experience then this restaurant is really a rare find, and it is guaranteed to deliver to its promise.